Drug Manufacturers Use Patents To Protect High Prices : Shots - Health News Repeated extensions of drug patents help fend off competitors, researchers say, keeping prices high. And the fact that Medicare and Medicaid can't negotiate for discounts doesn't help, either. "You've got a bunch of different tactics that are being used that can extend that exclusivity," says Aaron Kesselheim, a professor at Harvard Medical School and the study's lead author. He says the patent office is too permissive in granting patents for drug properties that have no bearing on its therapeutic value. Under the current law, new chemically based medications approved by the Food and Drug Administration get the right to sell their drugs with no competition from generics for five to seven years. More complex biologic drugs get 12 years of protection. 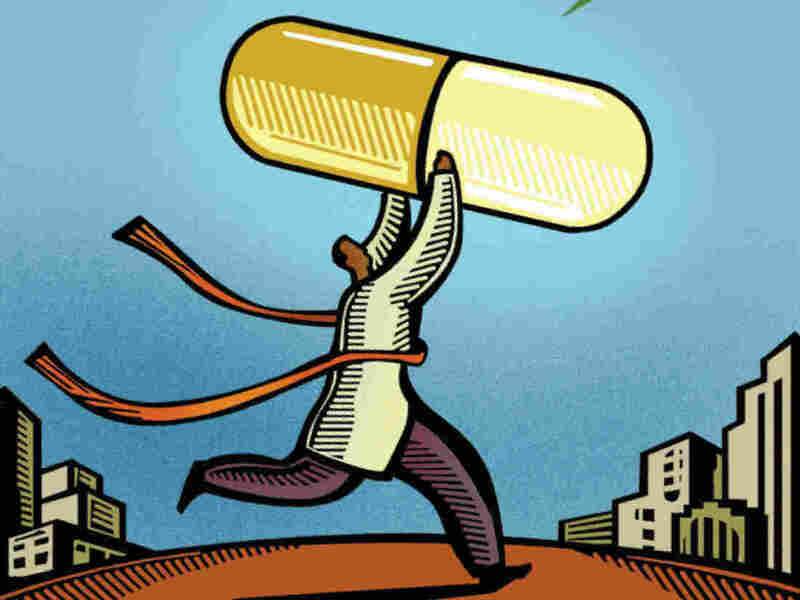 But drugmakers can also use their patents to keep competitors out of the market. The study found that new drugs have a median 12.5 years of exclusive market access, and it's even longer for completely new medications. Kesselheim says drugmakers often use "life-cycle management" tactics to extend their exclusive market access. He pointed to a cholesterol drug named Tricor-1 as an example. The medication was made by Abbott Labs. When a company applied to make a generic version, Abbott sued, delaying the competitor's entry to the market, according to an account excerpted in the blog The Incidental Economist. As the lawsuit proceeded, Abbott changed the dosage of the drug, named it Tricor-2, and aggressively moved patients to the new version. When the generic version of Tricor-1 was finally approved, very few people were taking it anymore. Kesselheim says the patent office is charged with protecting inventions that are "novel, useful and non-obvious," but that it has been lax in interpreting those parameters. If patents were harder to get on nonessential properties of medications, there would likely be more competition sooner. "We did a study a while back and found one HIV medication has over 100 different patents covering formulations and crystal structures and methods of use," he says. Drugmakers often argue that high prices help them recoup the costs of developing new drugs. But the JAMA study found no relationship between development costs and profits on medications. Still, the patent system does give companies incentives to take risks on new medications, says Jacob Sherkow, a professor of law at New York Law School. "Companies spend billions of dollars researching drugs and ushering them through FDA approval," Sherkow says. "They wouldn't do that unless they could charge supercompetitive prices to make up for those investments." Patents aren't the only price reduction tool available to the government. The JAMA study concludes that if Medicare and other government programs were allowed to refuse to cover some medications, that may also put downward pressure on prices. The health care program for the elderly and disabled buys about one-third of the prescription drugs sold in the U.S. But the federal law that created the Medicare prescription drug program bars it from negotiating for lower prices, while requiring it to cover almost all drugs on the market. Medicaid is also required to pay for all FDA-approved drugs. Ameet Sarpatwari, a study co-author, says the lack of information on drugs' prices and effectiveness makes it hard for government programs and consumers to compare them. "Those comparisons need to be done, and that information needs to be disseminated," he says.